Well, we did it! I (Sarah) raised over $1000 ($1468 to be exact) for St. Baldricks and tonight, I shaved my head as committed! Matt also shaved his head in solidarity. It was a lot of fun - we had friends over to help in the cutting, trimming, and shaving. Obviously, I will have to get used to the new 'do - but so far I am pretty pleased! 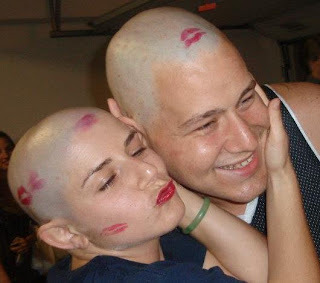 Of course, it's never too late to donate at: www.stbaldricks.org/participants/Sarah! There's a huge thanks to be given to everyone who donated and to everyone who came to support me in this crazy endeavor! Lather up the soap with the brush and apply to your face- you want to get a thick lather on your whiskers to provide good lubrication. Looking like Santa is your preference.